Weapon Stats & Strategy for Semi-Auto Sniper Rifle in Fortnite. Read here to find information about the damage(DPS), rarity, and reviews for Semi-Auto Sniper Rifle! The Semi-Auto Sniper Rifle has been vaulted as of the v6.21 update. This article will be updated when it returns to the game. 75 63 10 75.6 2.5sec. 78 78 10 79.2 2.3sec. The Semi Auto Sniper Rifle requires a learning curve to be powerful. It can do moderate damage in Duo, Squad, and 50 V 50 modes. This weapon works best in long-distance shooting. Enemy mobility makes it difficult to use in close-range. The Semi Auto Sniper Rifle has a magazine size of 10, allowing more shots & removing the need to constantly reload. This weapon comes in Epic and Legendary, so finding them can be rare. Check treasure chests & supply crates! Semi Auto Sniper Rifle's bullet drop makes aiming challenging. It also fires bullets loudly which will alert enemies. Try to target above your opponent's head or body. Use the crosshair and deal 2x damage with headshots! The Semi Auto Sniper Rifle has projectile bullets. Practice predicting enemy movement for successful hits! 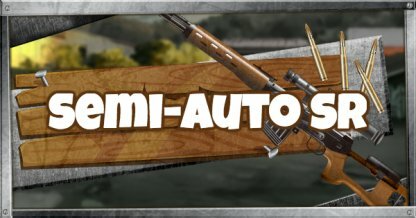 Experienced eyes and steady hands are needed before picking up the Semi Auto Sniper Rifle! If you find the both Bolt-Action and Semi Auto, pick up the Bolt-Action as it deals higher damage! Enemies move after one hit, so connecting another is difficult.